Are you a bit of a Yugoslav history geek and a lover of breath-taking architecture? Would you like to see with your own eyes something architects around the world admire? If you answered yes to these questions, you’re in luck. There is a place just for you, one you must not miss on your trip to Belgrade. Palace of Serbia, or SIV was a place where history was made. The magnificent Yugoslavia stopped existing over two decades ago. However, you can still find a great number of symbols of what it used to be in its former capital. One of the most significant ones is without a doubt this palace. The technical name of this building once was Savezno izvršno veće (Federal Executive Council), since it was used by the Federal Executive Council. The Council was the executive body of the Social Federalist Republic of Yugoslavia. It was later known as Palata Federacije (Palace of the Federation) and in 2006, after the secession of Montenegro, it got its current name. In 1946, an architectural design competition for the new building of the Presidency of Yugoslavia was announced. The team whose idea won first place consisted of architect Vladimir Potočnjak as the leader, along with fellow architects Anton Ulrih, Zlatko Najman and Dragica Perak. What the jury liked the most about this project was its functionality and monumental character. They also said that it had a “peaceful beauty”. The construction began in 1947, but it was stopped in 1949. After Potočnjak’s death, the project was taken over by Mihailo Janković, who brought many changes to the original idea by adding new elements. The main change when it comes to the interior was spatial organization and he pictured the exterior as more modern and luxurious. One thing that remained exactly the same is the overall H-shape of the building. The original plan was created according to the Socialist realism style, since Yugoslavia was an ally of the Soviet Union at the time. But, after the Tito-Stalin split in 1948, Yugoslavia abandoned the style, along with other elements imported from the Soviet system, so the new project by Janković was considered more modernistic. The H-shaped base of the building covers around 65,000 m². It was constructed according to the system of the reinforced concrete skeleton structure, filled with bricks. The façade is covered with the famous white marble from the Brač island and the openings are made of white metal. This marble was used by the Romans, and, in the modern times, in the UN building in New York and the House of Parliament in Budapest. Youth work brigades were a crucial part of the construction, since they came to Belgrade from all parts of the country to help build the Palace. Youth work actions – organized voluntary labor activities of young people – were common at the time. They were building everything from roads, railways to public buildings, all in the name of brotherhood and unity. The construction was completed in 1959. The Palace has around a thousand offices, 13 conference rooms, six salons, three large halls and two garages. The interior and exterior design were meant to symbolize the greatness and stability of the new Yugoslavia. The six salons are dedicated to the six republics of the former Socialist Federal Republic of Yugoslavia. Their design is based on traditional motifs and characteristics of every federal republic. It’s almost like each salon is a micro museum. The Serbian lounge is decorated with unique carpets inspired by the paintings of Lazar Vujaklija. The columns in the room are coated in bronze and have certain motifs from Serbian history engraved, all the way from the 1800s. The Macedonian salon is decorated only by Macedonian artists’ works of art. The central piece is a chandelier as well, made of decorated paraffin lamps and the interior is oriental. The Bosnia and Herzegovina salon is decorated with a magnificent tapestry called Forest. The walls of the Croatian one are home to the 20m-long painting called Gromače by Oton Gliha, which represents the crag-like Dalmatian landscape. The chandeliers in the Slovenian salon are shaped like the steleothems of the Postojna Cave. The Montenegrin is the host of the mosaic called Lovćen, which represents the hills and the sea of Montenegro. The entire salon is inspired by Njegoš, Montenegro’s most famous Prince-Bishop, poet and philosopher. That’s presented through the old furniture or the hand-made carpets which depict Montenegrins in national costumes. The magnificence of the building is enhanced by the works of many other artists, so beautiful it feels like you’re in an art gallery. Some of them are Stojan Aralica, Matija Vuković, Bora Baruh, France Slana, Milan Konjović, Drinka Radovanović and many other painters and sculptors. In front of the medium wing, there is a lower area covered with the glass dome where the Congress Hall is placed. It can accomodate up to 2,000 guests. The area is also called Yugoslavia Hall or Yugoslavia Salon. It’s decorated with magnificent paintings by Petar Lubarda and Lazar Vujaklija, as well as the triptych-mosaic The Creation of Yugoslavia, whose author is Mladen Srbinović. The theme in this room when it comes to paintings is supposed to be the idea of prosperity and faith in the future of a socialist country. This room is lit by the extravagant crystal chandelier, hanging from the dome. The main piece has 4,300 lightbulbs, it weighs around nine tons and is 18m in diameter. If you want to see more photos of SIV’s interior check this link here. Federal Executive Council was responsible for state affairs and supervising the implementations of laws. It had at least 15 members who were elected by the Federal People’s Assembly. It consisted of six federal secretariats : People’s Defense, Foreign Affairs, Internal Affairs, Finances, Justice and Freight Transport. Also, part of it was the Committee for Foreign Trade and 12 internal secretariats in Administration, Directorates, Administrative Institutions, Inspectorates and Commissions. Until 1963, the President of the Council (the Prime Minister) was also the President of the country. However, after 1963, the President of the Council was elected by the Federal People’s Assembly. The first President was Josip Broz Tito. The Non-Aligned Movement is a group of countries that are not formally aligned with or against any major power bloc. The organization was founded in 1956 on the Yugoslav Brijuni islands by signing the Declaration of Brijuni. The Declaration was signed by three key figures: Yugoslavia’s president Josip Broz Tito, India’s first prime minister Jawaharlal Nehru and Egypt’s second president Gamal Abdel Nasser. 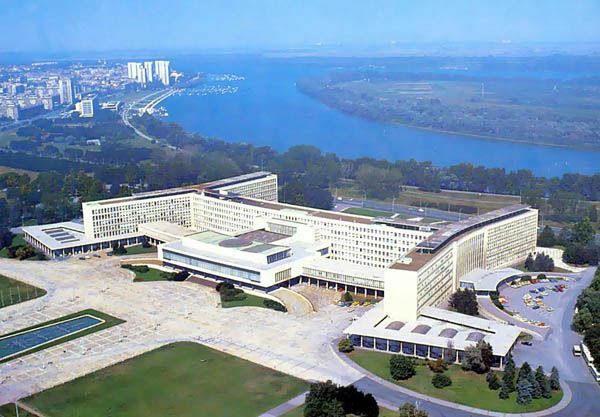 In 1961, Belgrade was home to the first ever Conference of Heads of State or Government of Non-Aligned Countries. Tito decided to hold it in the Federal Executive Council building. This was a historical moment; historical for the building, the country, as well as the entire world. In September of 1961, Belgrade welcomed numerous world leaders and representatives of many countries. In total, 25 countries – 12 Asian (Afghanistan, Burma, Cambodia, Ceylon, India, Indonesia, Iraq, Lebanon, Nepal, Saudi Arabia, United Arab Emirates, Yemen), 10 African (Algeria, Congo, Ethiopia, Ghana, Guinea, Mali, Morocco, Somalia, Sudan, Tunisia), along with Cuba, Yugoslavia and Cyprus. Bolivia, Brazil and Ecuador were represented by observers.Among the important officials were the Ethiopian emperor Haile Selassie I, the Indonesian president Sukarno, Ceylonese prime minister Sirimavo Bandaranaike (the first woman prime minister in modern history). This conference managed to bring all the representatives of the Non-Aligned Movement to one place. The representatives sat together at a round table in the Congress Hall. Everyone was welcomed by the host – Tito and his wife Jovanka. The speeches were simultaneously translated into four languages: English, French, Arabic and Spanish. Also, the Movement constructed their basic principles and political goals in Belgrade. They discussed the problems of colonialism, economical development and world peace. They said that they were voicing the aspirations of the vast majority of people of the world. Also, that all nations have the right of unity, self-determination and independence without intimidation or hindrance. At the end, they sent identical letters to USSR prime minister Khrushchev and US president John F. Kennedy. Between 1992 and 2003, the Palace was the seat of the government of Federal Republic of Yugoslavia or Serbia and Montenegro. From 2003 until 2006, it was the seat of the Council of Ministers of Serbia and Montenegro, the federal executive governing body of the country. The building is located in New Belgrade, an urban muncipality which started developing in the 1950s. This was one of the first objects ever built there. In 2013, along with all the art inside it, the Palace got on the list of National heritage sites. 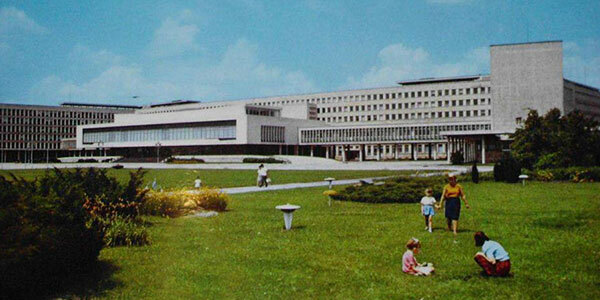 This architectural masterpiece is without a doubt one of the most impressive buildings from the communist era. The fact that people are still fascinated by it proves that greatness is timeless. Not only is it incredible to see, it’s even more interesting to remember the historical moments that happened inside it, somewhere underneath the chandeliers. This is one of the monuments that will always keep the Yugoslav memory alive, at least through architecture. Just remember the address Bulevar Mihajla Pupina 2 and add it to your must-visit list!